Speedway gas stations offer car owners a unique opportunity to make gas purchases more rewarding! Now when you shop at any Speedway gas station and present a special gasoline rewards credit card, you will receive gas rebates for each dollar spent. This is a great way to save a few dollars a day on routine gas purchases and auto related expenses! In addition to the cashback program, you'll also benefit from some of the lowest interest rates around, plus other great features that are available on a gas rewards card. On our website, we list credit card applications with gas rewards to help you select the best gas card to use at Speedway locations. We also display both the issuer's requirements and their terms and conditions so that you can apply online and get approved. 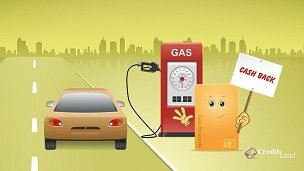 Credit cards with gas rewards come with the additional benefit of being accepted at many other gas stations besides Speedway. This is a great feature for those who like to compare prices at different gas stations in order to find the cheapest petroleum in the area. Unlimited acceptance also helps you maximize your rewards earned because you can then accumulate rebates at several locations instead of only one! How does the reward program work? It is really very simple: you just pay for fuel or auto maintenance with a gas rewards card and get cash back based on the amount spent. The more you spend the more cash rebates you earn! The issuer sets no limits or expiration dates on the rebates you can earn, and you can either cash them in at the end of each billing cycle or anytime you want. Some gasoline rewards deals give you rebates as a check or a gift card, while others will automatically credit them to your bank account. Remember, gas rewards are subject to the rewards program rules which are important to take into account if you want to receive the most rebates possible! I closed my Speedy Rewards credit card recently and want to apply for another card that will still allow me to get rebates at gas stations.